Steeped in tradition, the pomegranate has re-emerged in a contemporary food culture, through its healthy anti-oxidant properties and its beauty on a plate. The Hebrew for pomegranate “rimon" comes from the Latin "pomum" and "granatus" or "grained apple" and belongs to the family of myrtle trees. The pomegranate is also known as a symbol of righteousness as it is believed to have 613 seeds, corresponding to the 613 commandments of the Torah and it is listed as one of the seven species of fruits belonging to the Israel. 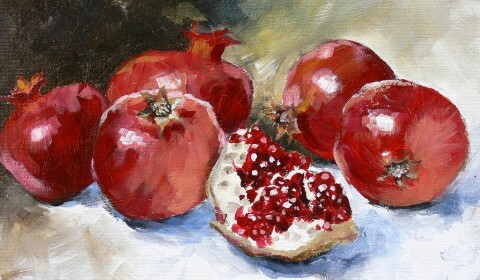 On Rosh Hashona, it is therefore tradition to eat the pomegranate, a fruit representing fruitfulness, knowledge and wisdom in the coming year, despite some scholars believing this was the 'the forbidden fruit' in the garden of Eden. This beautiful fruit has also believed to have had medicinal properties and claims to be effective in the fight against high blood pressure, diabetes, heart disease and prostate cancer. It is good source of natural fibre, iron and vitamins A, C and E and could be considered by some to be a 'superfood'. It is widely used in Middle Eastern dishes, adding sweet flavour, rich red beauty and a majestic presence to each and every dish.